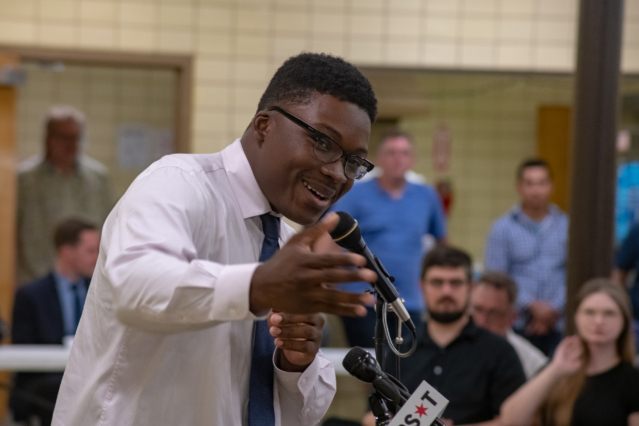 One thing was clear and frankly, obvious from the get-go at Wednesday evening’s mayoral forum – none of Rahm Emanuel’s nine challengers have much good to say about him. Residents of the 33rd Ward and beyond packed into a hot and humid basement meeting room for more than two hours at the Horner Park Fieldhouse to hear Emanuel’s challengers give short stump speeches about why they should be given the keys to the fifth floor at City Hall, and answer a few short questions from moderator and host Aaron Goldstein about their voting records and opinions on some of the hottest button issues the city is facing. 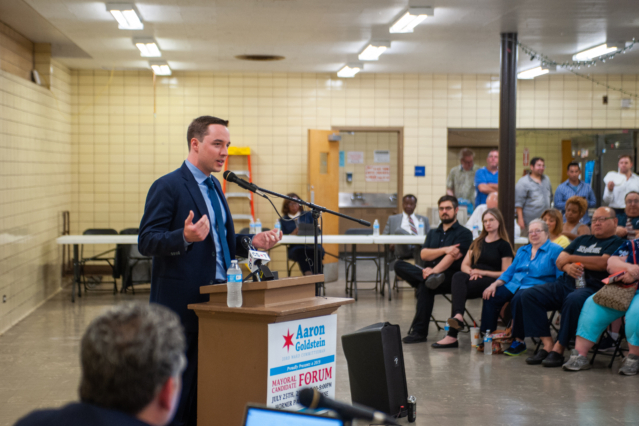 Aaron Goldstein, 33rd Ward Democratic Committeeman, addresses the audience at a mayoral candidate forum in Horner Park. Photo by Aaron Cynic. “Remember the ones who aren’t here when you go vote,” Goldstein told the crowd before calling up the first candidate to the podium. 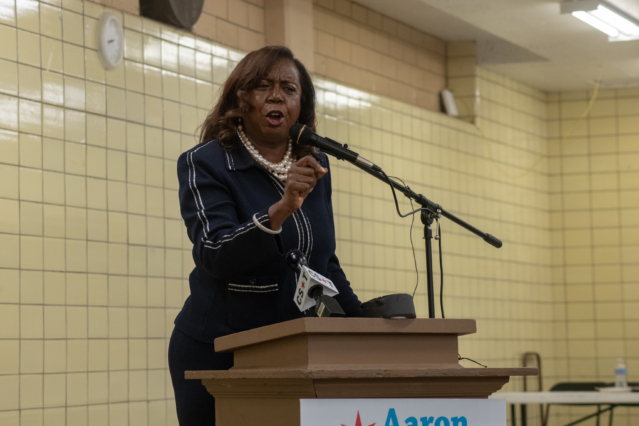 Given that nine of 11 potential mayoral candidates – Dorothy Brown, Amara Enyia, Ja’Mal Green, John Kolzar, Troy LaRaviere, Lori Lightfoot, Garry McCarthy, Paul Vallas and Willie Wilson – all showed up, it’s probably easier to remember the ones who didn’t, rather than did, most notably the mayor himself. It’s unsurprising Emanuel ditched the forum – the election is more than half a year away and he’s been busy trying on new fuzzy sweaters and making appeals to the fabulously wealthy to fill his campaign coffers to the tune of more than $7 million so far. Regardless of what anyone thinks of him, Emanuel is good at two things – raising money and public relations. And while ditching one of the first public mayoral forums might seem like and should be a bad PR move, it probably won’t be for Rahm. With the field as crowded as it is, his challengers need to find ways to set themselves apart from the rest of the pack, as well as find donors who can help them compete in a fundraising race Emanuel will most certainly win. 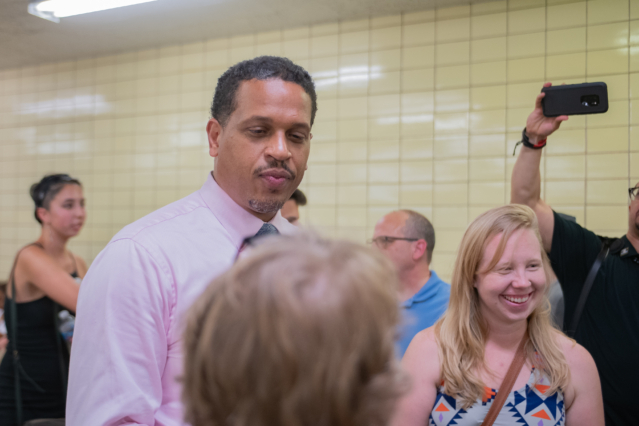 “Chicago does not have a mayor,” former CPS Principal Troy LaRaviere told the crowd in his opening remarks. 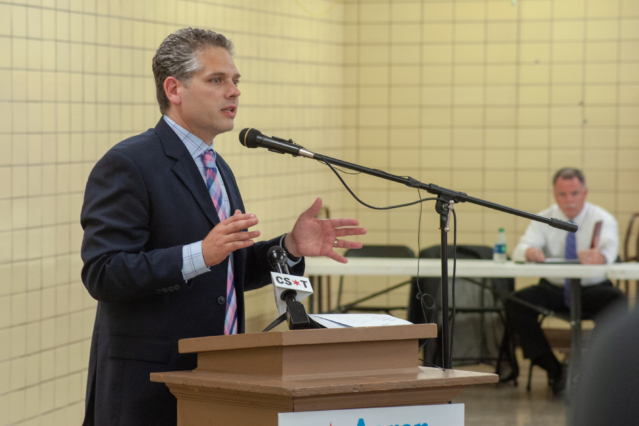 All candidates were given five minutes for an introductory stump speech and five for questions from Goldstein. “The bankers have a mayor. 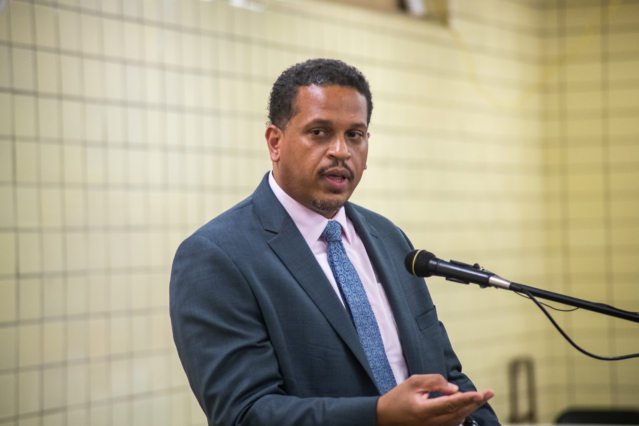 The corporate CEOs and vulture capitalists who want to privatize your school system have a mayor,” said Laraviere. LaRaviere was far from the only candidate who leveled populist criticism at Emanuel, particularly at his penchant for siphoning money and resources from neighborhoods and social programs and handing them over to corporations looking to move to the Loop or another rapidly gentrifying neighborhood. 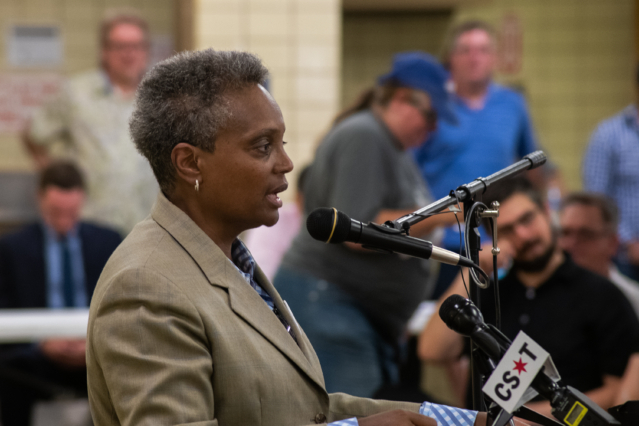 “There doesn’t seem to be a sense of urgency in this administration that we need to be better stewards of our tax dollars,” said former Police Board President Lori Lightfoot. 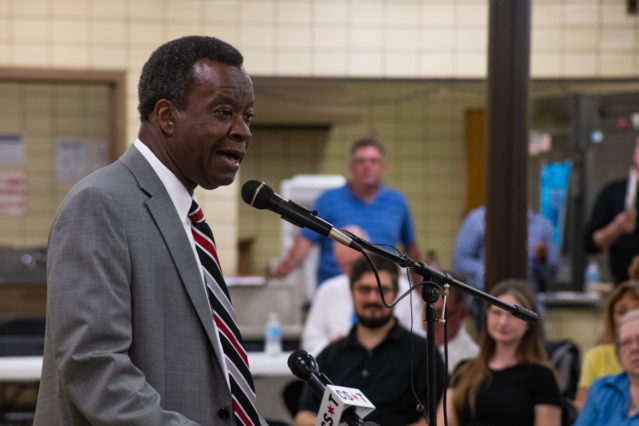 Businessman and former 2015 mayoral candidate Willie Wilson said that tax dollars should “represent neighborhoods” and be a reflection of those communities, not just downtown. 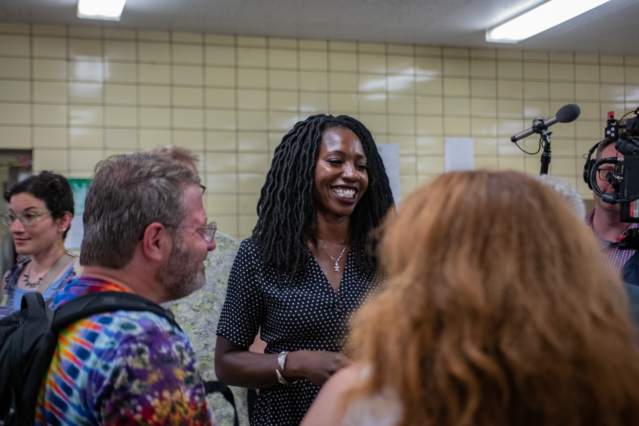 Public policy consultant Amara Enyia, who was also a brief contender in the 2015 mayoral race before being pushed out thanks to a petition challenge by Wilson also hit the mayor with a tale of two Chicago’s comparison. 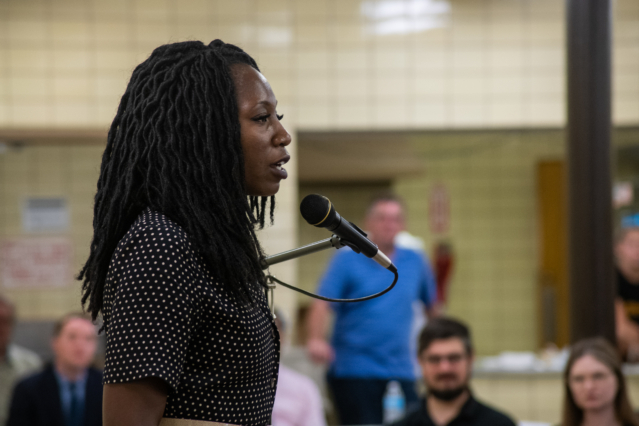 Public Policy Consultant and 2019 mayoral candidate Amara Enyia addresses attendees at a mayoral candidate forum in Horner Park. Photo by Aaron Cynic. Former Police Superintendent Garry McCarthy also attacked his former boss over resource allocation, saying that Chicago needs to “stop political spending in favor of needs spending,” calling out “pet projects, shiny objects, and corporations getting big tax breaks” as a bad habit of city spending. “We need a financial plan for this city that goes beyond a four year term limit,” he told the crowd. Since 2010, the city has shelled out an astounding $936 million in police misconduct settlements. Meanwhile, there’s almost a never-ending stream of high-profile cases of police shooting and killing people of color. Just this week, body camera footage released by Chicago’s Civilian Office of Police Accountability showed that 24 year-old Maurice Granton was shot in the back by police while attempting to scale a fence. More than a week’s worth of protests took place after police shot and killed 37 year-old barber Harith Augustus after surrounding him while he allegedly attempted to show them his firearms identification card. The shooting of Laquan McDonald became national news after body camera footage showed Officer Jason Van Dyke shooting him 16 times. “Nobody owns this gigantic expense,” said Lightfoot of the large amount of settlements against the city due to police misconduct cases, adding that judgments against the department never affect its budget. It’s easy to campaign on cutting crime and increasing public safety. But those are inexorably linked with both economic resources for neighborhoods and the way those neighborhoods are policed. Most who took the stage mentioned the desire for some sort of reforms of the criminal justice system, but for some of those who might’ve preferred to speak in platitudes, Goldstein at least attempted to pull out more definitive statements with pointed questions. Several candidates were asked if they thought Van Dyke was guilty of the first degree murder of McDonald. Both LaRaviere and activist Ja’mal Green gave a definitive “yes” when asked, with Green adding that he’s spent countless hours trying to make certain Van Dyke ends up behind bars. Others like Brown and McCarthy, prefered to leave it up to the justice system to decide. Enyia thoughtfully recalled how Officer Dante Servin was acquitted of all charges for the killing of Rekia Boyd due to overcharging. “We can say what he should’ve been charged as, but it’s incumbent upon us to put pressure to make sure that the City attorney’s are honest about the charges so that we can get a verdict that will equate to some measure of justice,” she said. 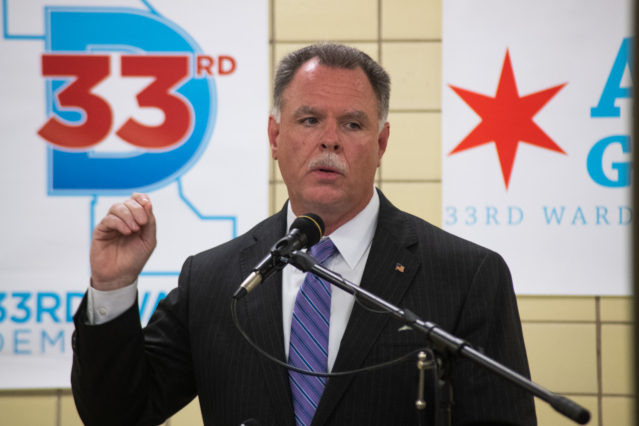 Former Chicago Police Superintendent Garry McCarthy addresses attendees at a mayoral candidate forum in Horner Park. Photo by Aaron Cynic. Accountability doesn’t only come in the form of criminal investigations or charges against officers who engage in misconduct. Candidates were asked if they supported the $95 new million police academy slated to be built on the West Side, and if they would support CPAC, a Civilian Police Accountability Council with more authority that would replace COPA, the current oversight entity that replaced the much maligned Independent Police Review Authority, which itself replaced another body. While some like LaRaviere said they fully support CPAC, some danced around the issue, with McCarthy saying he didn’t agree with everything in the proposal and he’d have to “go line by line.” In what seemed like a twist, the former Police Superintendent also said he doesn’t support the new police academy. Green also floated an idea that would involve requiring police officers to be insured, who could lose that insurance due to misconduct, which would then effectively remove them from the force. Troy Laraviere. Photo by Aaron Cynic. Dorothy Brown. Photo by Aaron Cynic. Lori Lightfoot. Photo by Aaron Cynic. Amara Enyia. Photo by Aaron Cynic. Former CPS Principal Troy LaRiviere speaks with attendees of a mayoral candidate forum in Horner Park. Photo by Aaron Cynic. 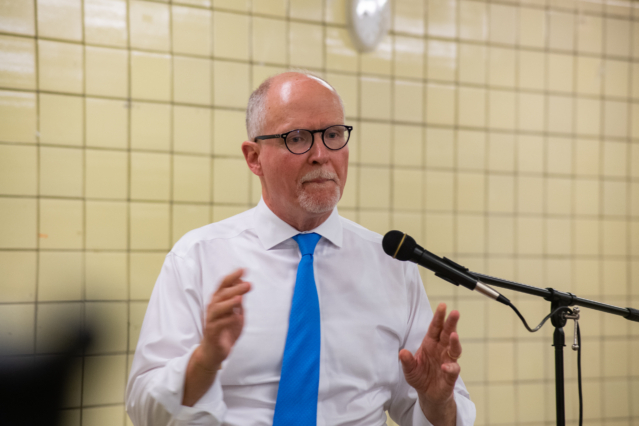 Paul Vallas. Photo by Aaron Cynic. Ja'mal Green. Photo by Aaron Cynic. Garry McCarthy. Photo by Aaron Cynic. Willie Wilson. Photo by Aaron Cynic. 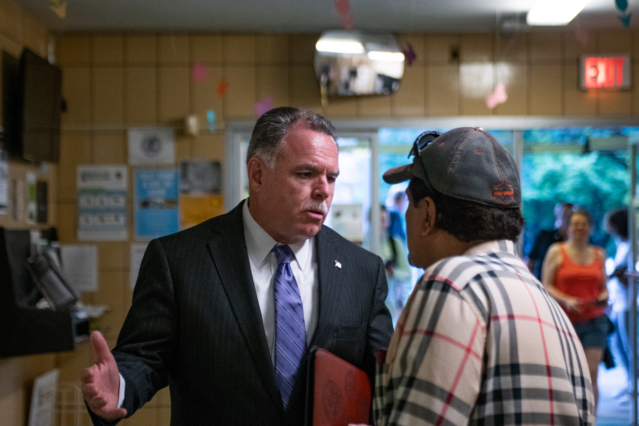 Former Chicago Police Superintendent Garry McCarthy talks with an attendee of a mayoral candidate forum in Horner Park. Photo by Aaron Cynic. John Kolzar. Photo by Aaron Cynic. 33rd Ward Democratic Committeeman Aaron Goldstein. Photo by Aaron Cynic. 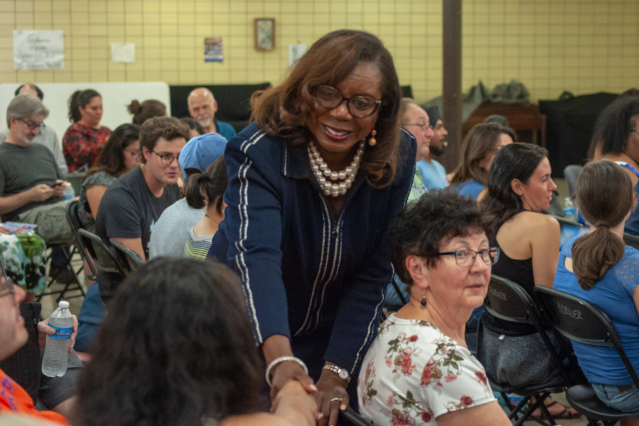 Cook County Clerk of the Circuit Court Dorothy Brown greets attendees at a mayoral candidate forum in Horner Park. Photo by Aaron Cynic. 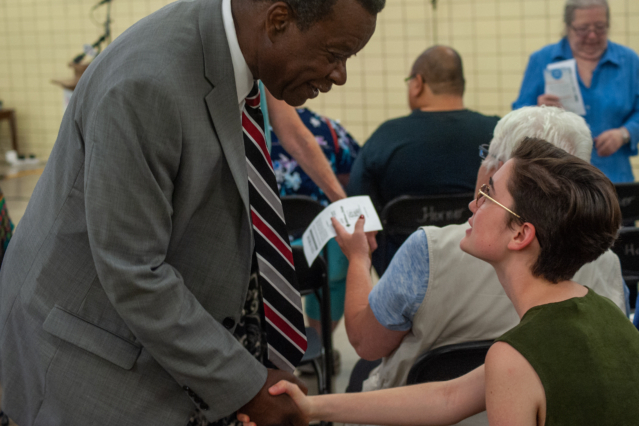 Businessman Willie Wilson greets attendees at a mayoral candidate forum in Horner Park. Photo by Aaron Cynic. 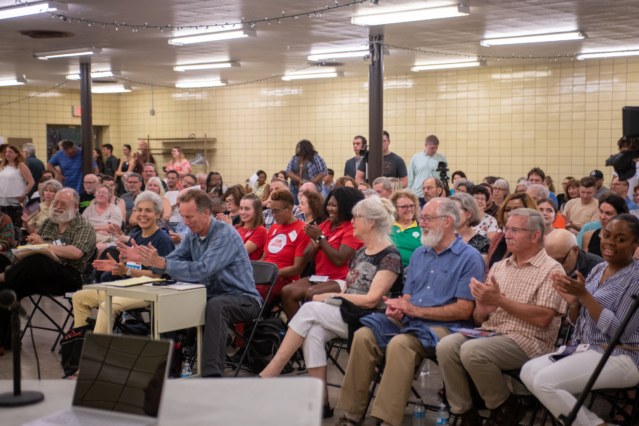 No one candidate exactly stood above the rest of the crowd of their competitors, but Wednesday’s forum was just the beginning of what will assuredly be a long electoral cycle to win the mayor’s office. Unseating Emanuel and even driving him into another runoff this term won’t be easy, but the 2019 mayoral election could give Chicago an opportunity to reinvent itself. One could tell the majority of folks at the podium in the fieldhouse were polishing their stump speeches, testing out jokes, figuring out which talking points work, and generally making an attempt to stretch their legs before running what will be assuredly a grueling race. But that’s not what Chicago needs. 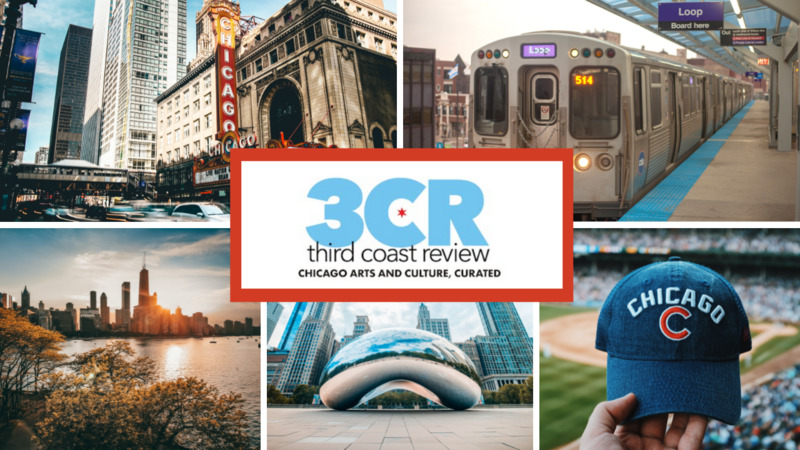 What Chicago needs are new, concrete, and compassionate ideas to solve the issues folks in the neighborhoods and communities have been hitting the streets over for the past eight years. Emanuel is a formidable opponent. But whoever can set themselves aside from the rest of the pack with a plan to fix the things that are broken or still breaking could have a real shot at beating him.